My favourite Stylecraft yarns are definitely the wool / acrylic blends. They are so easy to work with and are extra soft and squishy. I was ridiculously happy when Stylecraft added LIFE CHANGES to the Life family. Life Changes is a range of 8 totally gorgeous, rich, semi solid shades in a a luxurious mix of 25% wool and 75% Acrylic. To add to this they released five fabulous new shades of LIFE DK (Silver Nepp, Black Nepp, Mustard, Hyacinth & Deep Purple). 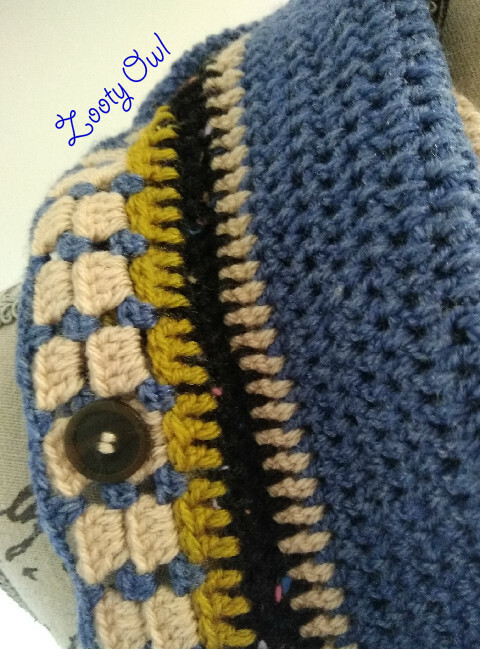 For starters I wanted to make something with a very simple stitch composition to truly appreciate the colour variations in the Life Changes. My COSMOS FIELDS SHAWL was just the right pattern for this. 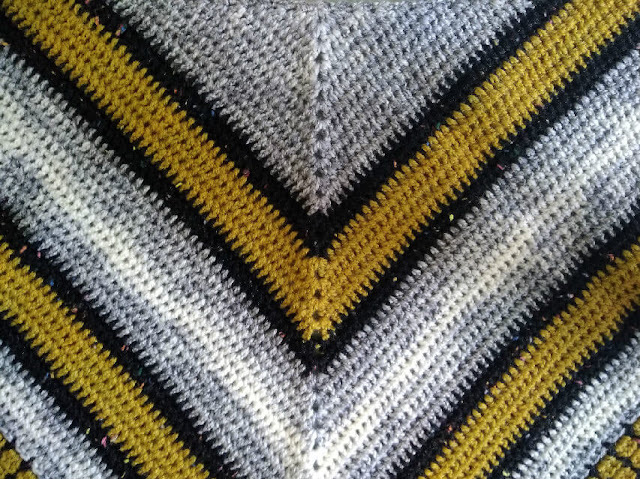 I crocheted 40 rows (15 less than the shawl) before starting the border. This makes for a very generous size triangle scarf. For this one I used Life Changes "Ashes", Life DK "Mustard" and "Black Nepp". Here you can see the beautiful subtle colour variations of the Life Changes. There was a ball of Life DK "Denim" lying on my table next to the leftover Mustard. 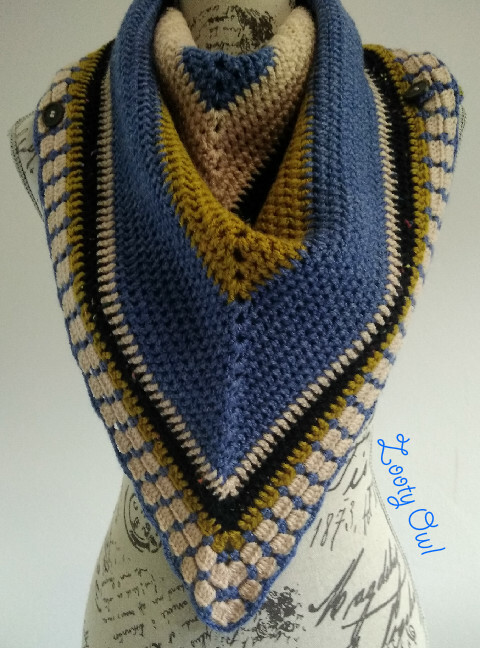 I really liked the combination of those two colours and so I made a second scarf using Life DK "Denim", "Stone Nepp" and what was left of the 100g of Mustard and Black Nepp. I can think of quite a few colour variations I would like to try with the Mustard!! 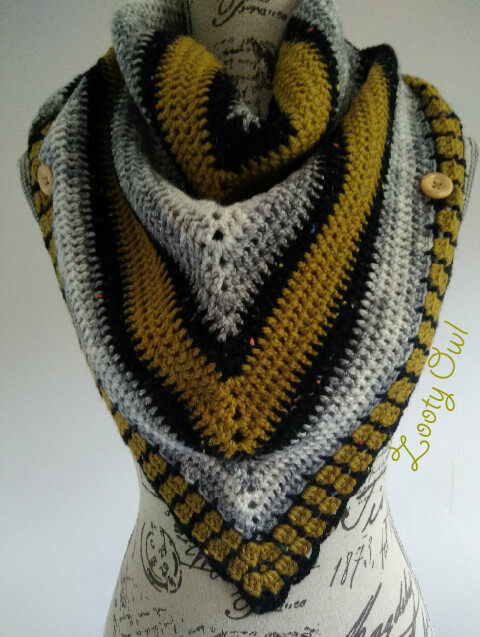 I have been a bit "hooked" on making this scarf. 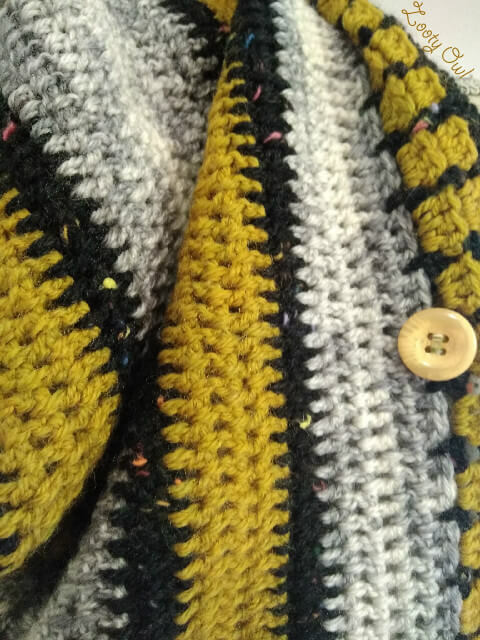 Over the next few posts I will share some lovely combos I have made using various mixes of Stylecraft. Until then ...... Happy hooking!